The fifth and final (for now) in Image's series of original hardcover Street Angel comics is here! 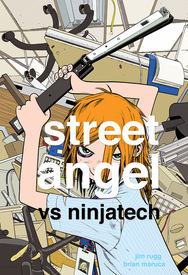 Street Angel vs. Ninjatech strips away the civilized veneer that covers the deadly reality of office politics and allows readers an up close and personal look at the self-absorbed male egos that are just asking for a beat down. And you-know-who is more than ready to give it to them!